More than 60 scientists and representatives of funding agencies and companies from 11 European countries gathered together. The aim was to discuss the scientific and technical overlapping topics of the two communities and to promote a common strategy for the future. 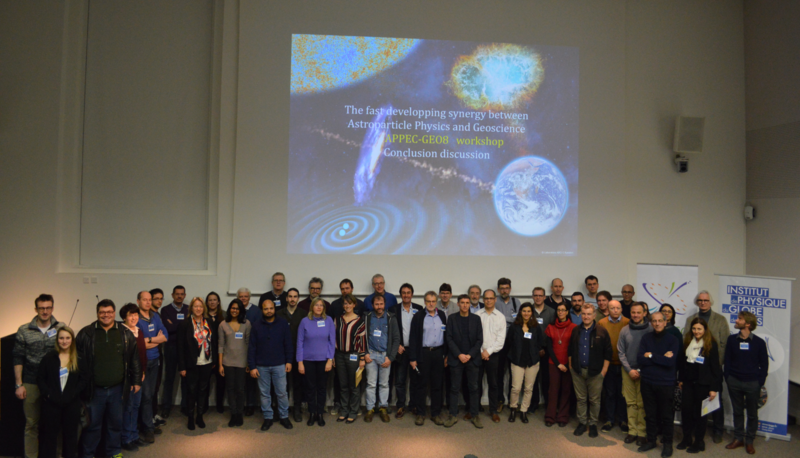 It is also important to note that in the framework of the EU-funded ASPERA ERANET, precursor of APPEC, three workshops in the period 2011-2012 had been organized and a brochure had been prepared in order to address and develop synergies between astroparticle physicists and geoscientists. 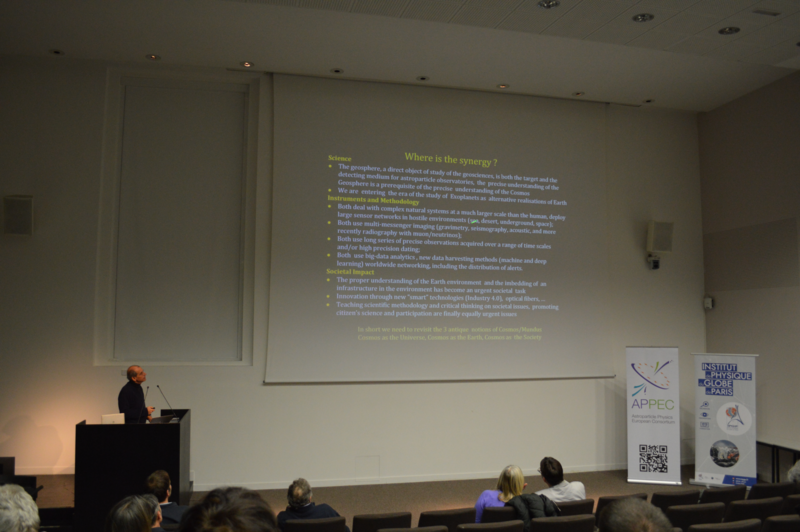 At IPGP, many overlapping aspects concerning science, technology/methodology and societal impacts have been identified. Some of the highlights are mentioned in the following. Neutrinos covering a broad energy spectrum and detected by different astroparticle underground, underwater and under-ice observatories have the potential to additionally give precious information about the Earth’s mantle and core. Cosmic ray muons, are a very promising tool to complement to geophysical imaging techniques such as gravimetry to investigate underground structures, with many applications ranging from volcano monitoring to archaeology and underground structure prospection. Methodologies developed in the context of gravitational wave research, e.g. for the monitoring of micro-seismic noise and/or stronger seismic incidents can have applications ranging from Earthquake Early Warning systems to the monitoring and risk evaluation of large civil infrastructures. Inversely, geoscientific techniques and algorithms realized for subsoil mapping and assessment of the seismic noise have a return to gravitational wave environmental noise hunting issues. Ocean imaging is another example of measurements that geoscientists and deep ocean neutrino observatories commonly perform, e.g. through the deployment of acoustic sensors. They can give precious information on seismic activity as well as hints about biological formations and the behavior of deep ocean life. More generally, astroparticle physicists and geoscientists working with underground or underwater facilities/instrumentation can reveal with unprecedented detail the characteristics and the geological role of “deep-life” in Earth or Ocean. An overview of recent discoveries on life in the deep Earth attracted much attention and confirmed the needs of investigations in extreme environment. On the technical front, the innovations concerning large distributed seismic and gravimetry networks based on very new technologies have an impact on both sides of the astro-geo-synergy. A common interest arose thus on the recent developments using optical fibers as distributed acoustic or strain sensors monitoring large areas as well as means of implementation of precise timing and synchronization.Last but not least, a geoscience observatory in preparation, the Krafla Magma Testbed (KMT, www.kmt.is) was presented as an example of a possible locus of development of synergies around a large infrastructure. The sustainable institution of yearly meetings on these common topics of synergy, eventually opening them to the global community. The effort to implicate ESFRI and Other World Class (OWC) infrastructures, from both fields in order to assess synergies has to be enhanced. The participants demanded therefore that next meetings could be organized close to large infrastructures of either field. The European Gravitational Observatory (EGO), host of the VIRGO gravitational-wave detector close to Pisa, in Italy, will thus be the location of the next workshop in 2020. It was also recommended to involve already existing overlapping communities, such as the geoneutrino one, already engaged in the organization of conferences and summer schools on shared topics. The common future demands concerning computing and IT technology, already the subject of COST actions (e.g. 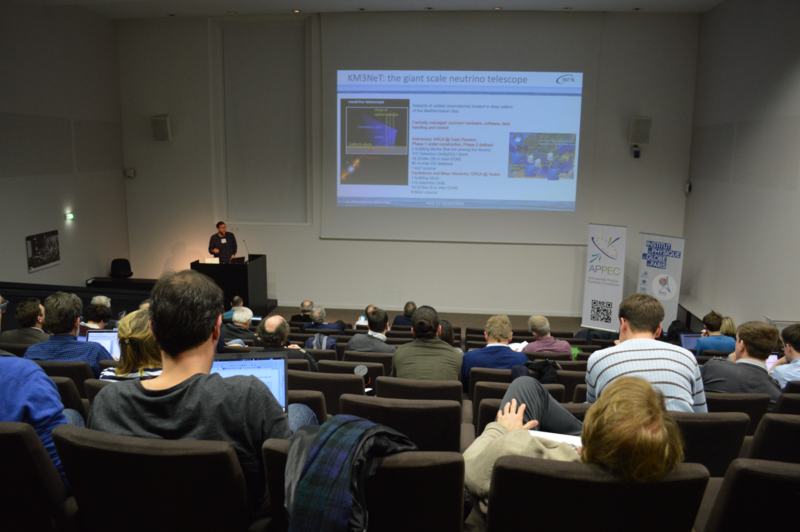 COST CA17135 on Machine Learning in Geoscience and Gravitational Waves) have not been deeply treated in the workshop in Paris but should be considered in the near future and included in a dedicated event and/or in the planned conference of 2020. In order to realize ambitious collective projects, the APPEC and GEO.8 representatives recommended to summarize the shared demands and aims in a roadmap for the upcoming years. An ad hoc working group for the preparation of this document will be soon established. The different funding agencies and organizations involved in APPEC, GEO.8, EGU and AGU – the European and American Geoscience Unions, could be then more easily engaged in joint activities involving for instance the realization of large infrastructures such as those proposed by the KMT Consortium. Concerning the consortia links, the Chair of the Executive Board of GEO.8 will be invited to the General Assembly meetings of APPEC as an observer and vice-versa. 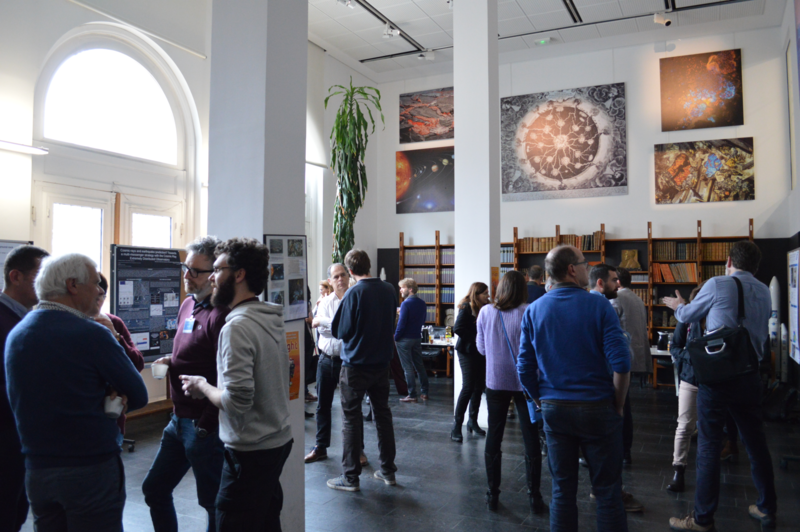 The Earth and Cosmic Sciences section of the Academia Europaea can provide the framework for further discussing and exploring synergies between astroparticle physicists and geoscientists. Last but not least, the EU framework programs Horizon 2020 and the future Horizon Europe are an opportunity to finance joint activities in different categories e.g. FET, ERC synergy, MSCA- COFUND/ ITN/ RISE, without excluding possible options in the pillars Industrial Leadership and Societal Challenges, and the respective successors in FP9.